Everyone is curious about Tsuta - the first ramen eatery ever to receive a Michelin star, awarded in 2015 - opening its first overseas branch in Singapore tomorrow (6 Nov 2016). There's only one outlet in Tokyo, and they only serve 150 bowls a day. Hundreds of hopeful diners in Japan begin queuing as early as 6am for a ticket to dine at the nine-seater establishment. The store does not open its doors until 11am, but tickets for the day typically sell out by 8am. There hasn't been a long storied past with Tsuta. Chef Yuki Onishi broke away from the fashion industry and started Tsuta only in January 2012. He apprenticed with his father who was a ramen seller. Chef Onishi focused on the shoyu broth and using a rich dashi (soup stock) to accentuate the flavours. The signature Shoyu Soba (from S$15 to S$22.80 nett per bowl) comes with a decidedly complex soy broth made with three types of shoyu. Two of the shoyu is formulated inhouse, and Chef Onishi has a brewer in Wakayama prefecture making the third to his specifications, and using soybeans that are matured for two years. Approach the ramen with Tampopo-like meditative appreciation, and you will experience the smoky depth of the shoyu broth enhanced with dashi made with whole chickens, vegetables, clams and other seafood ingredients. The toppings (optional) are simple: slices of char siu (nicely marinated), menma or stewed bamboo shoots, and an incredibly tender but salty boiled egg. A dollop of leek and truffle paste in truffle oil anoints the piping hot bowl of noodles. Purists may balk at this, but it's meant to give the ramen character, to help it stand out. 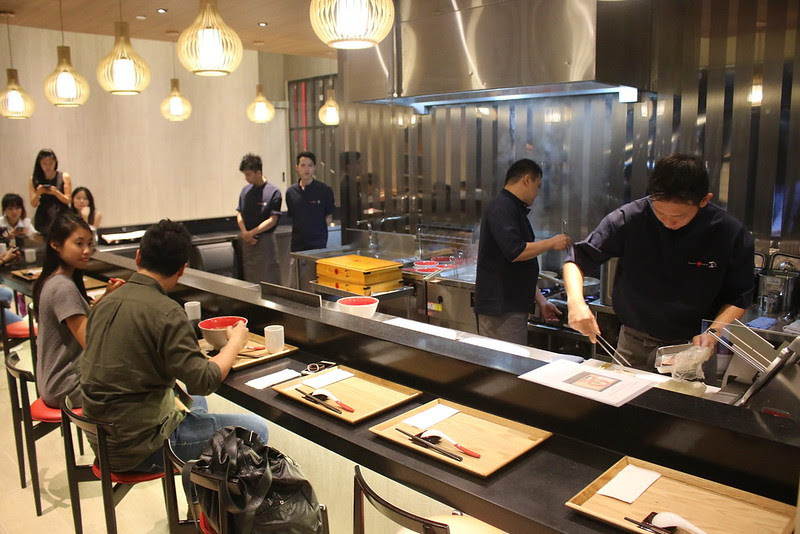 Tsuta, the only #Michelin-starred #Ramen in the world comes to Singapore. Chef Yuki Onishi's signature #Shoyu soba (#soba being the generic term in Japan for noodles) has a smoky depth from specially brewed #soy sauce blended with a rich #dashi stock made from whole chickens, vegetables, clams and seafood. Tsuta opens to the public on 6 Nov. Personally, while I enjoyed the shoyu soba, I'm still a tonkotsu girl at heart. I will go for the shoyu broth when I want something "cheng" - clear and light. I am curious to see how Singaporeans will respond to this shoyu broth, as the majority are steadfast tonkotsu fans. The Shoyu Shoba does have its own unique signature and is sophisticated in its own way. Will it be strong enough to carve a following among the palates craving something different? There is also a Shio Soba (salt broth, same prices) which is a chicken-seafood blend made by adding a careful balance of Okinawa sea salt and Mongolian rock salt. The two bowls look remarkably alike, as you can see from the first photo. The one on the left is the Shio broth. I thought I would like the Shio version more as I normally prefer shio to shoyu, but Chef Onishi's Shoyu is truly more exotic. A Miso version is coming at a later date. 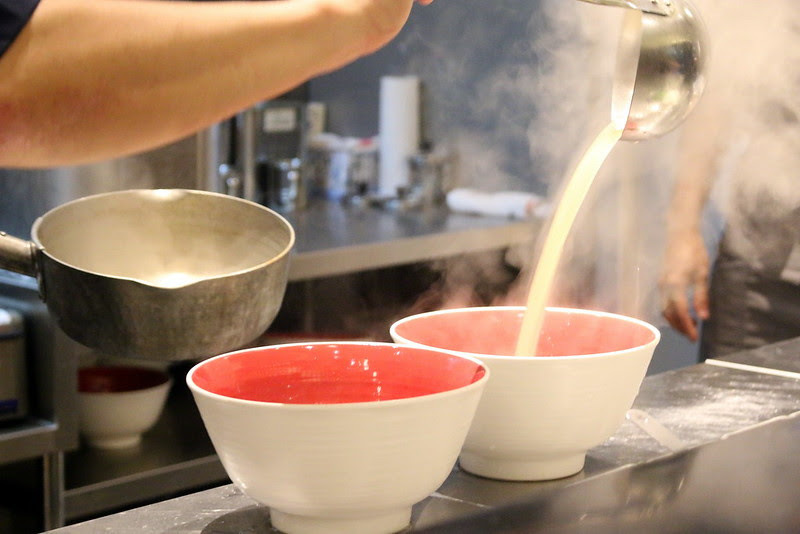 Tsuta’s noodles are handmade, as it is Chef Onishi’s motto to prepare ingredients by hand. Chef Onishi has also specially curated four types of whole wheat flour as well as whole grains to create the noodles. The smooth strands certainly are made for slurping! So is it ramen or soba, you wonder? It's called soba here, because in Japan, "soba" is a generic term for noodles. Singapore’s 18-seater outlet is a bright and cheery one at Pacific Plaza. The chefs here will be using the same special soy sauce and ingredients (as much as 80%) that its Japanese counterpart uses, so that the flavours are as close as possible. In Japan, they have a vending machine dispensing tickets for the ramen. 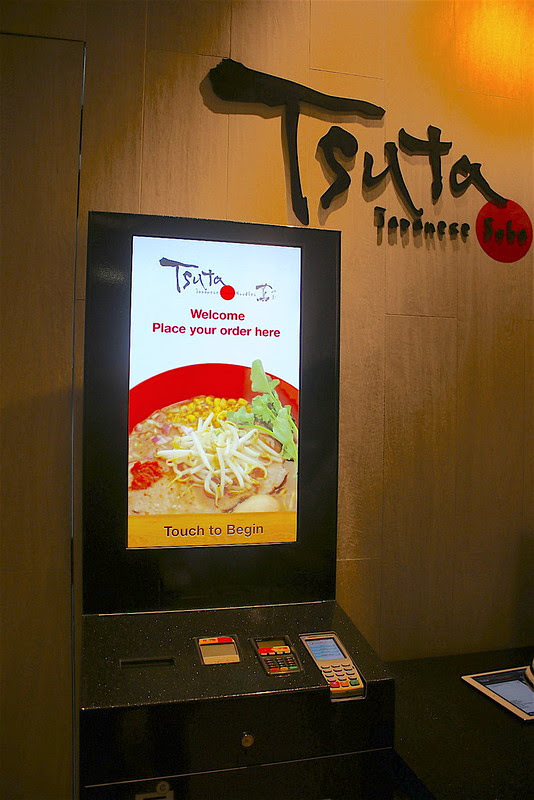 Here you get a touchscreen kiosk with photos of the food for easy ordering. You can by by cash or card, and even Apple Pay. You'll even get change back for cash! It's only one machine though, so I reckon the line that forms here is going to be made worse when a bottleneck forms with people who aren't familiar with this method of ordering. Many thanks to Tsuta for the preview!